Happy spouses are not always loyal. Recently, I had a close friend of mine who came to me to tell me that she and her husband might be getting a divorce. I was blindsided, they had a little girl together and seemed happy. Then she shocked me by telling me that she had an affair, even though she was very content with her marriage. Cheating was something my friend’s husband could forgive, but not forget. It broke up their family, and he told her that he might never love her again in the way that he used to. So, why did she cheat? My friend told me that after the baby the marriage wasn’t exactly exciting. Although they were happy with each other, life at home became bland, and they forgot to remind each other of the appreciation they had for one another. Then when an old, male friend reconnected with her she found a way to ignite the flame in her that had been barely burning. She loved hearing about how beautiful she was again. That flame may have been bright but it quickly died down. My friend stopped talking to him when she realized what a mess that she got herself into, and her old flame moved on pretty fast. Afterward, my friend felt completely alone and in shock. She realized her mistake and tried to work it out with her spouse. Unfortunately, trust takes years to create but only one second to break. Nothing was the same after that. This situation is more common than anyone realizes. According to Statistic Brain, 41% of marriages have at least one cheating partner. It’s haunting how one is never self-aware of what they truly want. My friend did not want her old flame, and they ended because they weren’t compatible once and the same thing happened all over again. What my friend wanted was excitement in her marriage, she wanted to feel beautiful and worthy again. Want to blame someone besides your spouse? (Or yourself?) Take a look at technology. Thanks to technology it has become extremely easy to cheat, both physically and emotionally. The convenience of technology can sway Even people in happy marriages. Adding to this, 40% of affairs that start online turn into in-person, physical affairs. My friend still is deeply in love with her husband and he still deeply loves her. Unfortunately, they are currently separated, and she is trying to win him back and explain her actions. He’s hesitant, but they are now going to counseling. She is hoping that they can work it out and I am rooting for them. So why does this happen in happy marriages? 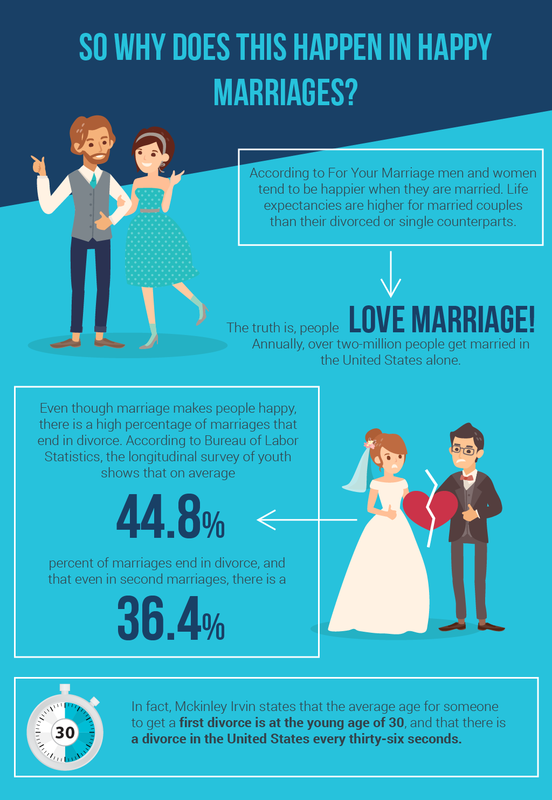 According to For Your Marriage men and women tend to be happier when they are married. Life expectancies are higher for married couples than their divorced or single counterparts. The truth is, people, love marriage! Annually, over two-million people get married in the United States alone. My friend was happy with her marriage, but she wasn’t happy with herself. This sort of scenario happens more often than you think, for both men and women. The lie that if a marriage is happy, there will never be an affair is what so many people tell themselves every day. Deep down we all know that anyone can cheat given the right circumstances. This is why, even though marriage makes people happy, there is a high percentage of marriages that end in divorce. According to the Bureau of Labor Statistics, the longitudinal survey of youth shows that on average 44.8 percent of marriages end in divorce, and that even in second marriages, there is a 36.4 percent divorce rate. No one goes into marriage expecting to get a divorce eventually, they go for a lifelong commitment. Couples who get married truly believe that their marriage will last a lifetime. My friend, for example, never thought that she would cheat on her marriage, but she had troubles explaining how she felt about her body after having a child. She handled her insecurities the wrong way, and because of the lack of communication within their marriage, it is now in jeopardy. Here is the nail in the coffin, my friend’s situation is not uncommon. In fact, Mckinley Irvin states that the average age for someone to get a first divorce is at the young age of 30, and that there is a divorce in the United States every thirty-six seconds. My friend is 28 years old. Her insecurities put her in jeopardy to be a part of that statistic. There is almost always a deeper-rooted reason that most people cheat and it has nothing to do with the marriage itself. It could be that maybe someone has to work long hours to pay the bills or they don’t make as much money as they want to. The insecurity could relate to could something from the past, such as a bad upbringing that caused low self-esteem. There may be past hurts that cause insecurities. And although men cheat more often than women, that gap is starting to close as women become more financially independent. Truthfully, long hours spent at work is another issue. Many married couples spend more time with their co-workers than their spouses. It is no surprise that according to Trustify, 35% of people admit to cheating while on a business trip and 36% of people admit to having an affair with a co-worker. What can you do to fight for your marriage? Remember always to keep communication open. Sadly, our society values maintaining an image of perfection even if you are screaming on the inside. Having open communication and comfortability with one another will allow you to communicate with your issues. Humans are imperfect beings, and everyone has issues and insecurities. Being able to discuss them together will not only help you solve and heal the very insecurities that weight you down, but it will also create trust and a close bond in the relationship. Remember that 100% trust means allowing your spouse into your life. There are private things in your life that you can keep to yourself, but if your spouse doesn’t want you doing something, don’t do it. Respect boundaries but also respect wishes. If you have feelings that may lead to infidelity, please discuss it openly with your spouse. If you don’t think they can handle something like that then maybe it’s time to question how compatible that you are with one another. If your spouse is secretive and has some strange behavior, its ok to do investigating. The both of you made vows when you were married and you have a right to know if they are breaking them. If you see a suspicious phone number, it may be wise to do your research. You have intuition for a reason. Cell phone lookup sites like National Cellular Directory can tell you exactly who your spouse is texting or calling. Men, this is a warning for you as well, females can be just as sneaky as their male counterparts. Don’t believe me? If there is infidelity and you still want to try to work things out, counseling is a good option. Being able to sort out all your feelings together with someone who has no personal investment will allow you to fairly share your feelings and see each side of the story. Being able to work through everything together will allow the both of you to move on so your marriage doesn’t turn into a broken record that can never be fixed. Truly forgiving and moving on is important so you can enjoy the rest of your life together. Please remember that it can have nothing to do with you. Your spouse could just be a terrible person in general. People have been known to being scared of commitment, and they don’t want to be alone. They want the best of both worlds so they may use you as a pawn to get both. This is called selfishness, and you should never be married to someone who uses you. And no matter what the situation, there is no excuse for someone to cheat. Even though these are reasons that people do, it doesn’t validate their choice. Because it’s always a choice. Don’t be shamed into staying if you don’t want to. And don’t ever stick around if you are being hurt physically or emotionally. No one deserves that. 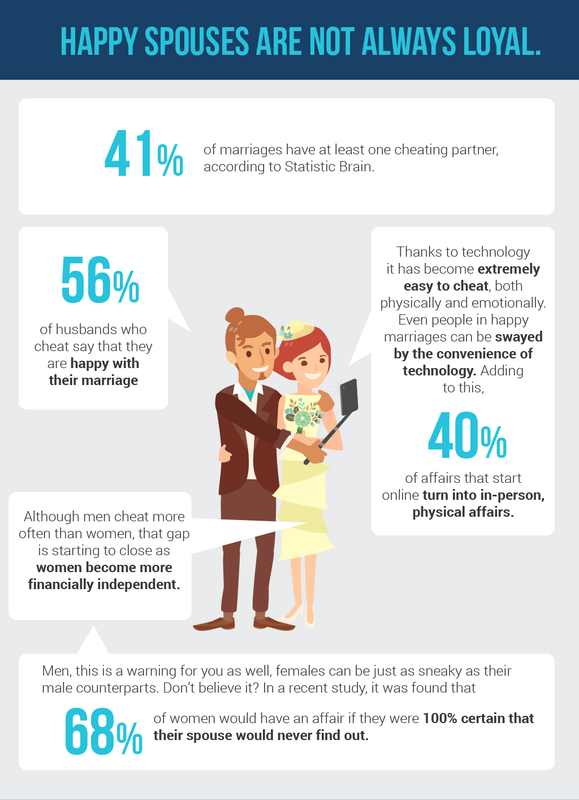 If you'd like to read the full infographic, follow this link: Full Infographic on Why People in Happy Marriages Cheat.